Man the cannon against the unsightly lumps from majestic Borb Bay. "I love Bubble Town and play it all the time. I really like the sound effects, and the Borgs are cute too. It's challenging without being overwhelmingly hard. You feel like you have really accomplished something, and it sure feels good to win." Banish the unsightly lumps from majestic Borb Bay in this cute and cuddly Marble Popper game. The Borbs of Bubble Town are under attack. Man the cannon and put an end to the Lump menace with some explosive help from the boisterous Borbs. Match groups of three or more Borbs to recruit them into dislodging the tenacious Lumps from their hiding places. Visit the magical world of Bubble Town today. 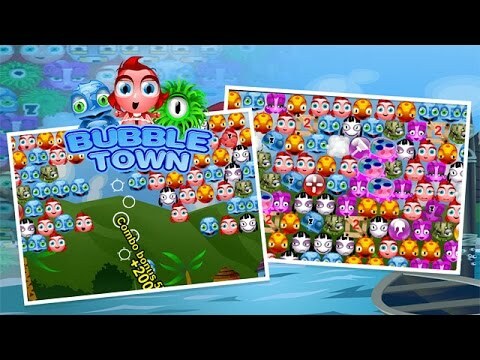 I've played Bubble Town for some time, and still find it is very challenging. To complete an area is extremely satisfying and I'm always anxious to see what the next level brings. It varies enough to keep my interest. I'm a sucker for a good puzzle game. Bubble Town is my new favorite. It combines matching and strategy, not to mention your ability to judge angles. I like the fact that time is not a factor. It makes it more relaxing for me. This game is so good, it's bad. I really enjoy it and find it a lot of fun, but I've wasted way too much time playing it instead of doing something more constructive. This is way beyond the basic Bejeweled type of Match 3 game. I like the fact that if you fail a level you can retry it (in my case, over and over again on some levels), and that each time a level reloads it's a bit different so you can't just memorize what to do in order to complete a level. The only frustrating aspect of Bubble Town is that once my kids started playing it, they raced ahead of me and finished the whole game. I'm still stuck on a level. Sigh.